Roughly chop Rosemary, Sage, Thyme & Garlic. Place Pork skin down, rub with ½ the salt, then press on the Garlic & Herbs. Roll & Truss closed with butcher’s string. Score the Pork Rind at 2cm intervals, rub with Olive Oil and the remaining salt. 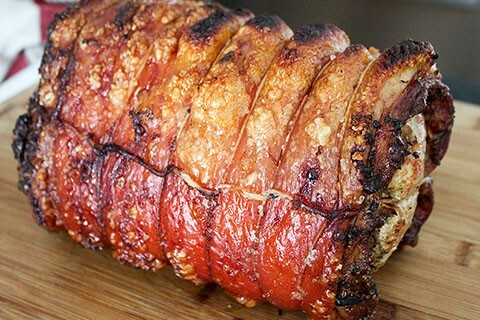 Place Pork in a Baking Tray and Cook in your Wildcat Wood-fired Oven at 250oC for ½ an hour. Baste a couple of times during this ½ hour. Allow oven to cool by opening oven door until it is at 190oC and then cook for another 1 ½-2 hours. Pork is cooked when the juice runs clear when pierced. Slice and serve with Apple sauce, gravy and your favourite vegetables. *If you are cooking baked vegetables place them in oven ½ hour before Pork has finished cooking and leave in until Pork has rested for 15 mins.